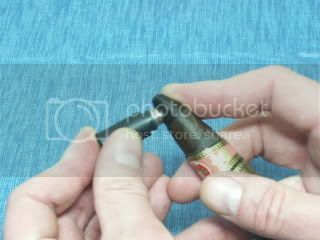 Anybody know where to cut a long tip cigar? Its a Ghurka Grand Reserve. I assume you mean its a torpedo. I usually cut mine about a half an inch in. The draw hole will look about the size of a normal robusto cut. No need to take that as an exact science, if it looks right, it probably is. Try to start a bit on the small side, and get bigger if you need to ... you can always cut more off, but you can never cut off less. Thats how I do it. Cut it real small, then draw test before and after lighting and nip a little more if needed. I dont think youll butcher it as long as you're reasonable. I think what maduro said was pretty reasonable, start small and get bigger. You just dont want to cut too large a draw hole, given it kinda can unravel the cap. Now, in my personal experience it can also burn too hot because you might pull more draw than you normally would and that can make it very difficult to smoke properly. You could try to punch it instead of cut it if your not quite sure.. I've never been a fan of the punch always seems to cause tar build up. i dont have tar build up ever. but then again i have a large ring gauge punch. I have a hard time cutting lanceros with it. id think that punching a torp from the side would cause draw issues... i dont have a cigar im willing to sacrifice to try that. i cant do it. ill stick to my double guillotine. Agreed. That has to build up tar. It has to. Two things kuzi about your sticks not building up tar. First that large ring gauge punch may be taking off as much I am with my Double Gui. Second, I've noticed by your reviews you smoke EXTREMELY slow. Some of the smokes that you and I have shared you have doubled my smoking time and I'm not that fast of a smoker. I smoke a little quicker than some but not so quick that I end up with harsh cigars. Not that this is a bad thing at all, more of an observation. I've tried to smoke that slow but it never fails my stick goes out and it never tastes right again after that. Where did the tip go in that second pic? That perspective looks like it has been angle cut on the tip, and punched on the side. I think its just a chisel cigar. I do smoke very slowly. I picked it up early on in my smoking career. I try hard to stay between 1 puff every 1 - 2 minutes. ive never had the burning out problem. i atribute this to my 65% RH. 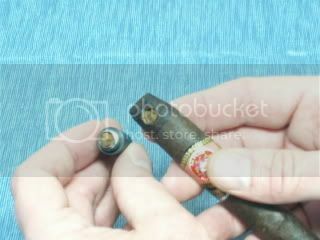 this makes me wanna smoke that nub thats now in the resting stage. could be interesting. my punch is large. I had a smaller one that did have tar build up. im almost sure that the size of the hole makes a difference. My smoking time has continued to extend as time goes on... I used to finish a regular 6x52 Toro in about 50-60 minutes. I am usually the first one to finish my cigar. But lately, through no conscious effort, my smoking times have gone extremely long (more like 80+ minutes for a 6x52). I think that this is actually because I've been holding the smoke in my mouth a lot longer. I used to keep the smoke for only a couple seconds, but I've found (on a really good cigar) I just don't let it go. I've also learned that I can continue to breathe through my nose without inhaling the smoke while it is in my mouth. This has led me to bleed the smoke out much more slowly. I've also become really good at putting smoke out through my nose, and don't need to inhale to do this, either. I think all of this is contributing to my extended smoking times, as I savor each puff and am not in such a hurry to get to the next one. I myself smoke very slow, I like to enjoy my cigar, in a way it's my way of relaxing. I've been known to smoke a cigar a little over 2hrs. Great for annoying my in-laws! I'm in the same boat duty, when I first picked up smoking I had no idea of how to savor the cigar, or how to take my time with it, I just rushed and puffed away like a machine, ruining quite a few cigars and not having an actual good experience. It was only after I really got into this forum and started learning from the elders how I should have been smoking my cigars. Where I used to burn through a robusto in 30 minutes, they now generally last me 70-80 minutes, a toro can go from 90 minutes to 2 hours for me, and a churchill takes me a minimum of 2 hours, and I like it just fine that way. What's funny is that I can't even imagine how I could smoke the cigar any faster.... I was always slower than my friends, but much faster than I am now. And unless I were to just turn my attention 100% to puffing on the cigar, I don't think I could get it to burn out that fast. At least I seem to be slower than you, which makes me feel better. Because I've been getting confused as my toros have extended to 90 minutes an beyond, and I've wondered if I just haven't given the cigar enough attention. But I've been enjoying them so much more. At least I seem to be slower than you, which makes me feel better. Don't get too much slower than me.... it is not uncommon for me to have to give a few strong puffs to resurrect the burn when I get lost in thought staring up at the stars, I'm surprised I don't get any burnouts. in my older reviews i would also post burn times. a toro would usually take about 90 min or so. i stopped doing that because the times were very consistant. no point really. ill make sure to do it for the Nub. Joe, I get similar times, but I've seen kuzi post 2 hours for a robusto. That's crazy. I don't see how a robusto could last two hours without burning out at least once... I don't know, I think I smoke somewhat slow, but nowhere near that level, and 2 hour robusto is Jedi master level, I'm but a mere Padawan learner. i did? where? i musta forgot about that one.